My name is Jess Yarnell. I’m a software geek during the week and an amateur nature photographer on the weekend. I’ve been maintaining the catandturtle website since 2004. Keep reading to find out more about catandturtle photography. Well…my husband Rich and I selected the domain name when we just had a personal website. Our love for cats and turtles gradually grew into hobbies (obsessions?) for gardening, nature, and photography. The catandturtle domain name just sorta tagged along. How did we get into bird photography? Little did we know what we were starting! The wild grackles found the feeder in a matter of days. We learned to identify the Boat-tailed Grackles and their friends the Red-Winged Blackbirds. They tossed seed down to the ground, where the Mourning Doves were happy to sit and eat it. The next spring, a small red bird with the sweetest little song made his debut in the neighborhood. Our first House Finch! Goldilocks and Squirt discovered that bird-watching was a very agreeable way to pass the day away. (It must be understood here that our cats are inside-only cats. We have bird feeders conveniently located outside the best windows, where the cats can sit and watch the birds.) Goldy would very carefully stalk the birds, whereas Squirt would walk right up to the window, meow a hello, and pounce, which of course scared away his entertainment. Goldy might be asleep anywhere in our house, but if I called out “bird-bird-bird”, she’d come racing out to see it. Around the same time, I got the brilliant idea of trying to make a couple of flower beds around the back of the house. A friend (hi Wendy!) told me about Lukas Nursery and all the wonderful plants there. I discovered that I had a green thumb, and I spent a year or so in a garden craze, transforming the barren backyard into a flowering insect paradise. One bed led to another, and in less than a year, we had one of the most colorful yards in the neighborhood, complete with a viburnum hedge “fence”. After all, we needed to attract more birds to the yard, right? The birds came. So did the butterflies. I had always been a shutterbug, but now I needed more than a point-and-shoot to get decent pictures of all my flowers and new garden visitors. (Besides, I wore out the shutter on my point-and-shoot!) So Rich got me a DSLR. A week later, after seeing that the birds were tiny specs in my photos, he got me a 300mm lens. Happy day! ‘Spellbound’ was our first rose. It grew really, really well, and bloomed profusely. So much so that it began my obsession with roses. As I added more flower beds, I kept making space for more roses, until growing the collection to almost 50 bushes. That’s a lot of roses! Next the gatitos twisted our paws into adding a screen room to the back of house. That way we could all sit outside and enjoy our pretty yard (and all the birds!) Soon we were using our porch table more often than our dining room table. The cats didn’t mind! The cats liked the porch even more than we thought they would. 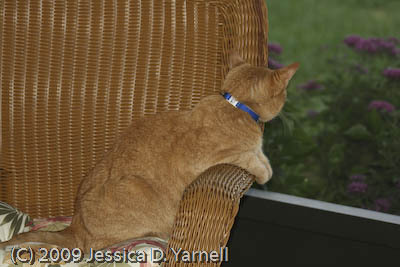 Squirt began to spend his days pawing at the sliding glass door, begging to go outside. Squirt discovered that a grill is a cat’s throne, and Goldy found that watching birds is much more exciting when you can hear them up close and personal. All plants planted on the porch become a smorgasbord for Squirt, whose favorite snack is a six-pack of pansies in the wintertime. I found that many, many more kinds of birds come into the yard than I ever imagined. (Our neighbor Carla sometimes asks incredulously, “Do you really see all those in our backyard?”) I began serious bird photography after reading an article about Oakland Nature Preserve’s (ONP) photographer Mike Brinkley. We also began visiting places like Oakland for hiking and bird-watching. One day, my dad suggested that we visit the Circle B Bar Reserve in Lakeland. Wow! We visited in November and saw so many different species of birds. Although it was a bit of a drive from Orlando, it was an incredible place. By springtime, after seeing our first Sandhill Crane colts, my dad and I became regular visitors to the reserve, usually going at least once a week. It’s amazing how much you can learn about a place by photographing it regularly! Over time, Rich’s interests turned in other directions, and I continued my photography with my dad and other friends (hi Michael!). I discovered places like Viera Wetlands, Fort De Soto, and Merritt Island National Wildlife Refuge. Now I get up willingly at 4 in the morning on the weekends to go out and shoot sunrise. As my photography interest continues to grow, I blog about my adventures beyond the backyard. I spend less time with roses these days, but I continue to blog about the garden and the birds that visit the backyard. And with the addition of Whiskey Loopy to our family, there are still plenty of bird-watchers in our house! …And so began the obsession with birds, roses, and photography. Thanks, Goldy! Our fur-babies rule the roost at our house. They are spoiled rotten and know just how to twist Rich and me around their little paws! Goldilocks was our beautiful princess. She was Jess’s cat before Rich came into the picture. Read her story. Squirt is our Diablito and Flufferbuddy. His story is here. Whiskey “Loopy” is our kitten. His story is here. My mom taught me to cross-stitch when I was in fourth grade. It’s been a hobby ever since. Below are some of my favorite projects that have been featured on my website. Many people don’t know that I am fluent in Spanish. After college, I got to spend a month studying in Madrid. See my trip journal and photos here. In high school I made LEGO robots and taught them how to “read.” Click here to meet Obstinadisimo! Being more stubborn than computers is a trait that comes in handy in my day job!